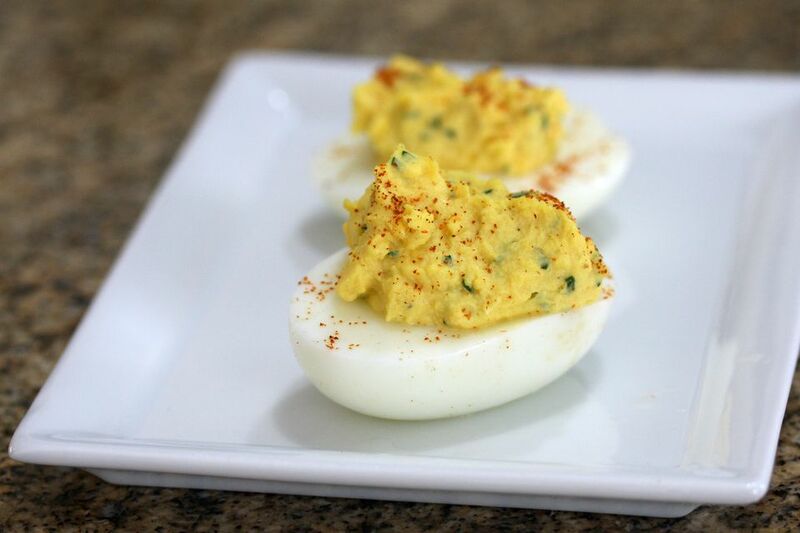 These deviled eggs are always a hit, and they're super easy to prepare. Just cook the eggs and mix the yolks with the simple ingredients. The yolks are then stuffed back into the egg halves. This recipe makes 1 dozen deviled eggs, and it's easily scaled up for a party or larger gathering. For a special occasion, line a serving platter with kale or greens. Arrange the deviled eggs on the greens and scatter small grape tomatoes or cherry tomatoes among the greens along with large ripe olives and cornichons or gherkins. Put the eggs in a saucepan and cover with water to a depth of about 1 inch above the eggs. Bring the water to a full boil over medium-high heat. Remove the saucepan from the heat and cover the pan. Let stand for 15 minutes. Drain and cool the eggs with cold water. Eggs are generally easiest to peel right after they are cooled. See the tips for more egg advice. Halve or quarter the eggs; scoop the yolks into a small bowl. Mash the yolks and add the mayonnaise and Dijon mustard. If desired, moisten with more mayonnaise and Dijon until the desired consistency is reached. Stir in white and light green part of the sliced green onion and most of the chopped parsley. Add salt and pepper to taste. Using a small teaspoon or pastry bag, fill egg white halves or quarters. Sprinkle with the reserved sliced green onion and remaining parsley. Sprinkle lightly with paprika. According to the American Egg Board, eggs may be safely eaten 2 to 3 weeks beyond the "sell by" date. If you aren't sure of the freshness of your eggs — local eggs might not have a sell-by date or the packaging might have been discarded — fill a bowl with cold water. Place the eggs in the water. If they sink to the bottom of the bowl, they're quite fresh. If they bob a bit and stand on one end on the bottom of the bowl, they are a few weeks old, but still fine to eat. If they float to the surface, they should be discarded. If you cook eggs too long or at too high a temperature, you might find they have a greenish ring between the yolk and the white. While the discoloration is unattractive, it is harmless.